For the ultimate in performance on highly tuned piston ported race motors, choose Mikunis most technologically advanced and best flowing carb - the TMX. 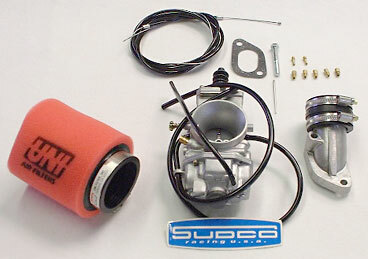 This carb delivers amazing power throughout the powerband for your stock cylinder or Rapido kit and is incredibly easy to tune. The kit comes with everything you need, including Uni foam filter, intake manifold, hardware, cable, intake manifold gasket, and spare jets. Dont forget a cable choke conversion kit #0492.A if you are running full bodywork.